Braxton’s Animal Works had a chance to interview Jodi Button from Francisvale Home for Smaller Animals. They have over 100 years of experience with pet adoption, and we are thrilled to continue our collaborate with their organization. Tell us about Francisvale Home. What is the history of the organization? When Francisvale Home for Smaller Animals releases dogs and cats to new families, we spend a good deal of time understanding the parameters of that new experience. It is important to understand that we will have spent time with every adult and animal in that new home. We also will have made an actual visit to make sure that the potential for a successful relationship between that family and that prospective pet is going to be a good one. We know our animals really well in part because we’re relatively small. We never have more than about 90 animals on the property. We treat them predominantly as pets and have consistent training processes on our end, wherein all of the staff and all the volunteers are relating to the animal in the same way – as in underscoring that the person goes through the door before the dog, a focus on positive training using different “value” treats to teach good behavior, etc. – protocols that we share with the families. We also offer the new owners access to ongoing support throughout the animal’s transition and beyond. A dog may present problems with hoarding its food because perhaps it has spent its life on the street and has some idiosyncrasies around territoriality. We would work with the new family to understand the ways in which we had supported the dog in feeling less frantic, less anxious, more likely to be sort of at ease around food times, and would offer ways they could continue to work on that area of vulnerability. 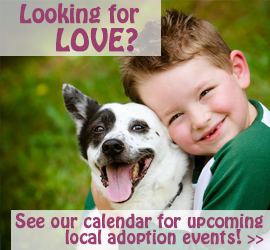 What would you say are the biggest challenges when adopting pets, people face? It is really important to take the time and effort to make a match that both parties are going to benefit from. So, if someone comes in and says, “I really love the look of that St. Bernard but I live in a studio apartment, that may not be an ideal scenario. We ask people to identify the kind of relationship they are hoping to foster with that animal during a phone interview. By the time that family or that individual arrives, we’ve selected several animals that we believe may suit them, and we introduce them, one after the other, to see how everyone connects. If a particular animal stands out, we ask the prospective owner to think about it overnight. If they wish to proceed, then we ask to meet each person and animal in the home to insure that all have a very good shot of a harmonious relationship. What types of people do you typically see that are good fits for adoption? You kind of touched on it before, where you can go through the matching process based on lifestyle or personality. I think that you have to assume that the great majority of people out there who are genuinely interested in sharing their lives with an animal are a good fit for some dog or cat. However, particularly if they’re new to pet ownership, it may be that it’s worthy of a couple levels of conversation before they walk off with an exuberant puppy, for instance, who is clearly endearing but might need immense amounts of attention. I think that it’s about managing expectations on the human’s part. It is true that once in a while we will come across someone who may not be a really good match for us at all. It does not happen often and we are happy to suggest other places where the fit might be better. For instance, if you’re really interested in a de-clawed cat, we have de-clawed cats waiting to be adopted and you’re welcome to consider them. But if you’re going to take a cat that is not de-clawed, and then you wish to have that operation done, we’re going to request that you not. There are lots of other places you can go where that restriction may not apply. There are very few times when there isn’t an opportunity for someone to have a decent, long-term, mutually healthy relationship with an animal. Occasionally though, when somebody calls in and says, “I’ve never had a dog before and I’m only interested in a Newfoundlander . I have a tiny backyard and there’s no fence.” Then we might say to them, “Would you consider these other options, and if not would you like us to get back to you when we find a situation that is more appropriate to your present circumstances? Generally speaking, with a little bit of patience, good matches can be found that are permanently happy for all. We do speak up if we don’t have the right match at the moment, and we do speak up if the person’s needs appear to be in contravention of what we understand to be integral to a successful adoption. We fully recognize that if we do not take the high road in addressing each party’s requirements, then the human suffers as well. When people run into roadblocks with their adoptive pets, and I’m sure there are many cases of that, does Francisvale help with any type of transition? Absolutely, yes. One of the reasons that the kennel manager does a home visit is insure that if the breed of dog requires a fence that it is high enough to prevent danger, that the owner has all the information needed to protect the animal’s wellbeing. Sometimes people will call back two weeks later and say, “I’m absolutely in love with this animal at this point, however, I am struggling with a particular kind of behavior.” We will either go back and spend time with them to resolve the matter or we’ll talk the owners through it. In the great majority of cases all these things can be worked out. Given the significant amount of scrutiny we do beforehand the return rate of placed dogs and cats is very low. We have very few dogs or cats returned unless someone develops an allergy or is leaving the continent for instance. However, from time to time, someone will call and say, “I was sure I was ready for a puppy. But it’s driving me crazy in the middle of the night. What can I do to deal with the whining?” Or, “How do I transition from crate training?” Or, “Is it time for me to go to a class and which one would you suggest?” Or, “Will you come over here and just spend some time observing because my pre-existing dog, who was fine when they met, is now having some jealousy issues, and I really need to figure out how to handle this so that the dog doesn’t become depressed.”. Where can readers learn more about Francisvale? 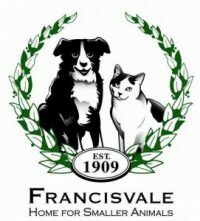 Francisvale is a 103 year-old no kill shelter which makes it the oldest, or close to the oldest, in the entire country. There was a couple that were headed into Philadelphia by horse and buggy in the late 1800’s to attend the theater on New Year’s Eve. It was a cold, wintry night and when they looked down, they saw cowering in the snow, a little dog that they picked up and called Francis. He was such a good pet that they were inspired to create what was really a very radical idea at the time – a no-kill shelter for dogs and cats in need. Francisvale offers opportunities for adoption, for volunteering and for supporting the organization in any number of ways. If you access www.francisvalehome.org. you will have an opportunity to see a bio on every animal on the property and learn how to become involved..
Once a month – generally the third Sunday at 1:00pm – we invite prospective volunteers for an orientation to learn about the wide range of opportunities that are available – dog walking, cat socialization, community outreach, event planning, technical support and much more. We also spend time in schools, at Rotary Clubs and on-site speaking with those of all ages who are keen to learn more about animal welfare and how best to support Francisvale’s mission. So if educational projects interest you, we have plenty of fascinating pursuits underway. Francisvale will be at our Annual Harvest Fest this year, so be sure to stop by and say hello.